Regulatory economists often focus their research on regulations originating from the federal government. Even for analyses of US states, they frequently focus on broad indices that attempt to measure the regulatory climate across states or the varying impact of federal rules on different states. More recently, however, State RegData—a database built on the QuantGov platform—gives researchers and policymakers the ability to conduct industry-specific analysis of state-level regulatory restrictions. Extending the logic of the RegData project to US states, State RegData converts regulatory text in state administrative codes into datasets containing statistics about those regulations, such as restriction counts, word counts, and industry relevance. State RegData adopts the RegData methodology of using text analysis to quantify words and phrases that typically signify legal prohibitions or obligations in regulatory text—specifically, shall, must, may not, prohibited, and required. The project also uses machine learning algorithms to assess the probability that restriction counts are relevant to specific industries. The RegData project’s approach is more fully explained here. The quantification of regulatory restrictions permits comparisons across states. Since every dataset must be uniquely developed for each state administrative code, the scope of State RegData is still expanding, with 24 states currently represented as a cross section. 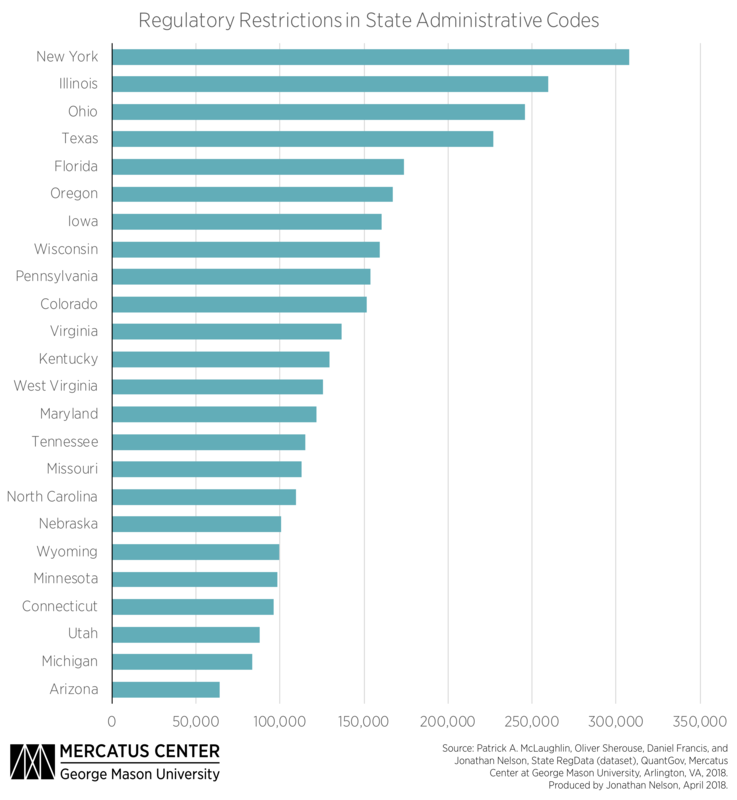 So far, New York has the most regulatory restrictions in its administrative code, with more than 300,000 restrictions, while Arizona has the least, with fewer than 65,000 restrictions on the books. The majority of states fall between 100,000 and 200,000 restrictions. By comparison, there were about 1.08 million regulatory restrictions in federal regulations in effect at the end of 2017, which means that states on average appear to have roughly 10 to 20 percent the number of regulatory restrictions as the federal government. Furthermore, it is not merely total regulations at the state level that matter but also which industries are affected. Determining the best way to assess the regulatory burden on an industry has its challenges. First, cumulative measures have a problem with double-counting, since significant overlap in the types of regulations that states adopt is likely. Many businesses only operate in a single state, and even businesses operating in multiple states do not necessarily have a drastically higher burden if rules are relatively similar. Second, mean numbers of restrictions could be biased by outliers if certain states have unusually regulated (or unregulated) sectors. Using median restriction counts mitigates both issues. State RegData identifies industries by using the 2007 version of the North American Industry Classification System (NAICS) at the three-digit level. 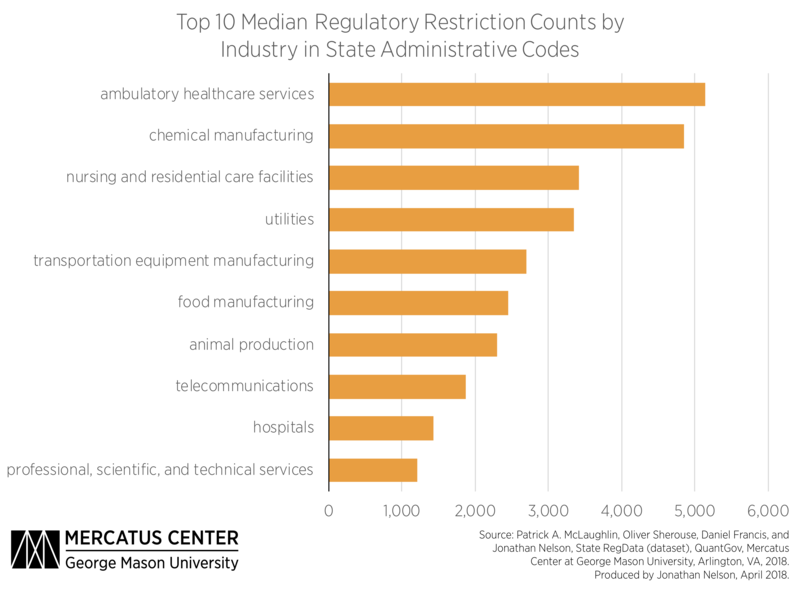 Unsurprisingly, the top 10 median industry-relevant restriction counts are concentrated in sectors such as medical services, manufacturing, and utilities. The most regulated sector is ambulatory healthcare services (NAICS code 621), with a median of about 5,000 restrictions. This database provides information that is quite distinctive from that of federal RegData. Federal agencies and state governments have different jurisdictions and priorities, and the most regulated industries at the federal and state levels often depend on specific legislation (e.g., Dodd-Frank). While the impact of federal regulation on states varies, that is due to variation in the makeup of state economies rather than different amounts of regulation. Conversely, state regulatory texts exhibit vast differences in what sectors they regulate most stringently. For example, the utilities sector (NAICS code 221) has the most industry-relevant restrictions for Missouri, North Carolina, and Wisconsin but does not appear in the top 10 targeted industries for Connecticut, Maryland, or Nebraska. State RegData will eventually cover as many of the states as possible. When State RegData is used in conjunction with data on federal regulations from RegData, researchers will have the opportunity to work with comprehensive data that use a consistent and comparable metric across time, place, and industry.